Rippedsheets.com now offers wide format printing with award-winning technology. Now get custom signs, banners, and much more. Rippedsheets.com now has wide format printing capability, with an award-winning wide format printer. This new printer has the ability to print CMYK, white, and clear inks! This can be done on both roll media and rigid substrates up to .5” inch thick and 64” wide. With the option of layers of ink, custom patterns and images that stand out can be created. This is perfect for signs, banners, backgrounds, and window displays. There are many different material options for this high-tech printer. The machine holds flat substrates in place in order to control warp and has a built-in take up system to support a large number of roll media. This helps keep the print at the best quality possible. With the technology of this wide-format printer, smooth graduations in highlights and shadows, flawless fills, and bright colors. The graphics can be created using any combination of matte and gloss finishes. White ink can be printed on clear material for a number of applications including food packaging. Because the ink is Eco-Friendly and UV Cured, it is great for indoor and outdoor use without using harsh chemicals that would damage our environment and provide a possible danger to clients or others. 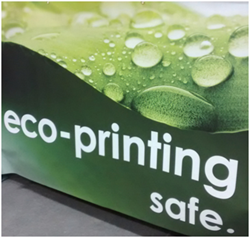 The banner materials are phthalate free and are in compliance with REACH, RoHS, and CONEG standards. The wide format printer is a new addition to the Rippedsheets.com capabilities. They have over 550 different label materials that can be diecut to any shape or size as well as custom printed. They also offer custom tags and wristbands. Please contact the customer service specialists at 1-888-791-9590 for more information about wide format printing. For more information about labels, tags, or wristbands visit the website or contact customer service.